Fish oils are a good source of omega-3 essential fatty acids. Salmon, mackerel, herring and sardines are especially nutritious sources because they have higher fat content and therefore provide more omega-3 than other fishes. 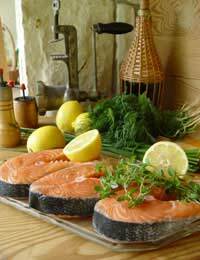 For instance while 4 ounces of salmon contains up to 3,600 milligrams of omegas-3 essential fatty acids, ounces of cod contain only 300 milligrams. Cod liver oil is the most commonly used fish oil and is milder tasting than other varieties. Cod liver oil however, is not recommended as the sole source of EFAs as this would require and overdose in vitamins A and D to obtain the required amount. People suffering from diabetes should not take fish oil supplements because of their high fat content, though it is safe to eat fish for its essential fatty acids. Eating oily fish like salmon, tuna or bluefish at least twice a week can help prevent heart disease. Omega-3 essential polyunsaturated fatty acids also block excessive sodium and calcium currents in the heart. Those excessive electrical discharges cause dangerous and erratic changes in heart rhythm, so eating these types of fish can also help prevent sudden cardiac death. There are different types of fats you need to learn about. Saturated fats increase your risk of heart disease and are found in meat, butter, and coconut oil. Saturated fats should be avoided until your cholesterol levels are down and you are at a healthy weight. Even the most stubborn red-meat eater can enjoy legumes, nuts, and seafood for their main protein sources. Monounsaturated fats like olive oil will help to protect your heart. Olive oil is a great choice for cooking, or for use as a dressing or dipping sauce. Polyunsaturated fats come in two types, called Omega 3 essential fatty acids, and Omega 6 essential fatty acids. Omega 6 essential fatty acids are found in corn and other vegetable oils. These essential fatty acids are important, but we tend to get too many of them and not enough of the Omega 3s. Fish are the best source for Omega 3 essential fatty acids, but obviously fish oil wouldn't be such a good tasting choice for cooking or for making dressings. Walnuts, flax seed, and canola oil are all good sources of Omega 3 essential fatty acids. They all make better choices than corn oil, sunflower oil, and safflower oil, which all contain mostly Omega 6 essential fatty acids. Canola oil is the best choice for sautéing, so use flax oil and walnut oil for salad dressings, or just eat the nuts and seeds. Water-soluble fibre like the fibre found in oats and oatmeal will help to control your cholesterol. Fibre found in whole grain products will help to control sugar absorption, will help to keep you feeling full, and will keep your digestive system healthy.